Dornroschen was installed in 1992 in the Sangerfest section of the park in front of the present-day Kidzopolis children's area. In 2009, the ride was moved to Rockville, renamed Amerigoround, and took over the spot once occupied by the Chaos attraction (removed in 2005). In the summer of 2017, Six Flags Fiesta Texas announced that Power Surge would be demolished to make way for a new 2018 attraction: Wonder Woman Golden Lasso Coaster. It was also announced that Amerigoround would also be moved to make way for the new attraction. In November of 2017, the park began dismantling the ride. The ride underwent an extensive refurbishment with an outside company. On July 18, 2018, the ride reopened in its brand new home next to Sangerfest Halle in Spassburg. Dornroschen is moved from the Spassburg park area to Rockville and renamed Amerigoround. 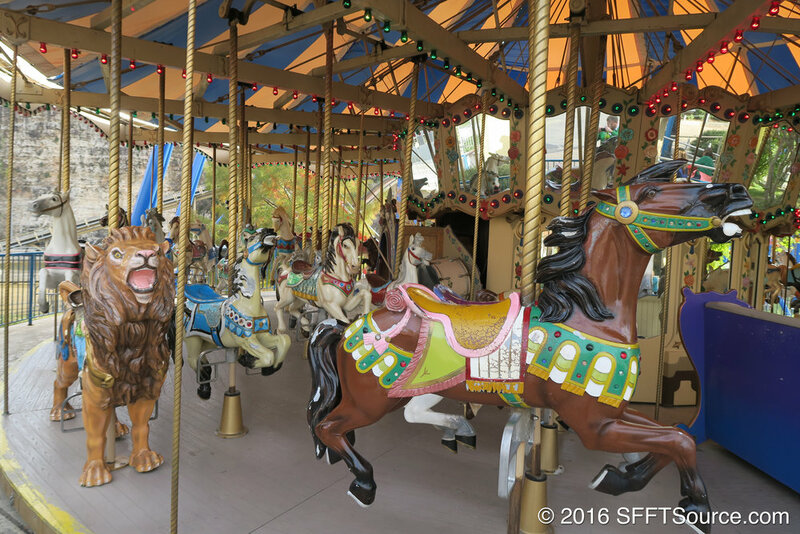 Amerigoround is renamed Grand Carousel and moved back to Spassburg, near Sangerfest Halle, after an extensive refurbishment.